Women require fewer calories than men, according to the Dietary Guidelines for Americans 2005 report. When an aggressive weight loss plan is in order, choosing a 1,000-calorie-per-day program can help you lose weight quickly and efficiently. 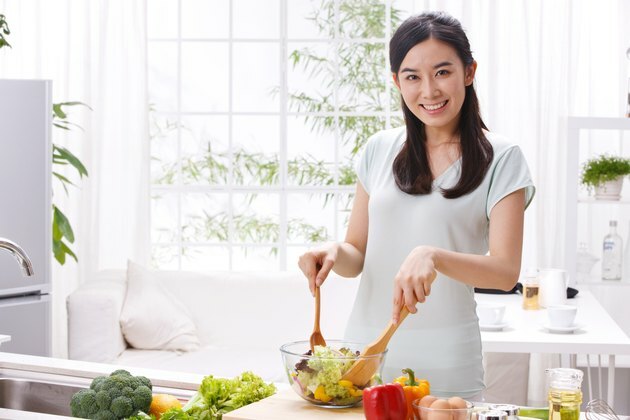 Because this dieting approach is relatively low in calories, you should consult your doctor prior to starting this type of eating plan to be sure that it’s a good choice for you. Losing weight and eventually achieving your optimal body weight can help women reduce their risk of several obesity-related diseases, such as heart disease, arthritis, osteoporosis, gynecological disorders, breast cancer and others, according to the U.S. Department of Health and Human Services (HHS). By reducing your daily caloric intake and exercising on a regular basis, you can achieve the type of weight loss that will reduce your risk of getting any of these potentially deadly diseases. Aside from lowering your risk of developing any obesity-related diseases, a low-calorie diet plan can help boost your energy levels and help to improve your overall self esteem, according to HHS. An increase in energy can help to boost your productivity throughout the day, and an increase in your self-esteem levels can lower your chances of becoming depressed and reduce instances of high social anxiety. A 1,000- to 1,200-calorie-per-day diet plan is a safe way for women to lose weight, according to HHS. They define a safe rate of weight loss as losing 1 to 2 lbs. per week, which is the equivalent of 3,500 to 7,000 calories per week. If you are currently eating about 2,000 calories a day, switching to a 1,000-calorie-a-day plan will help you achieve 1 lbs. of weight loss per week. Please note that if you are an athlete, you may require additional calories to compensate for the extra energy burned during intense physical activity. One key to cutting down your daily caloric intake is to focus on portion control. When planning an eating plan of 1,000 calories per day, you must divide these calories equally throughout the day to ensure your energy levels remain steady. This means that on a three-meal-a-day schedule, you would want to portion out about 334 calories per meal – breakfast, lunch and dinner. With such a low-calorie count per meal, you need to make wise food choices that are low in calories. A low-calorie diet needs to consist almost exclusively of low-calorie, nutritionally dense foods, as well as foods that are high in fiber. Fiber can help you feel full throughout the day and help with the digestion process. A 1,000-calorie diet needs to include plenty of vegetables, fruits and whole grains. Also, lean protein sources, including skim milk, chicken and fish are ideal low-calorie foods that provide your body with the protein it needs.